The Band of the 25th Stirling (Dunblane) Boys’ Brigade is delighted to welcome you to its 2018 Spring Concert. All are invited to join us for an exciting evening of music at Dunblane Cathedral on Sunday 18th March 2018 at 7.30pm. The evening will include a wide variety of music played by our 40-strong Concert Band, ranging from movie soundtracks to classical music; and from marches to mazurkas: there will be something for everyone. Boys will also perform in small ensembles and there will be some solo performances from those boys working towards qualifications in their instrument. It will also be the first performance opportunity for the nine boys in our training band, who will be supported by our experienced players. Tickets are £5.00 (adults) and £3.00 (children) and can be purchased at the door or in advance by calling 01786 821387 or e-mailing info@dunblanebb.org.uk. 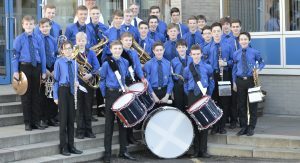 All proceeds will support the work of the Band and the wider BB in Dunblane, as the boys look forward to their week-long tour of Germany in August 2018. If you can, please display this concert poster in a prominent place to help us advertise the concert.